Bono parques is a personal and non-transferable card that grant the cardholder access, as many times as he or she wishes, to the Madrid Zoo Aquarium, to some of the other parks belonging to Grupo Parques Reunidos in Spain, such as the Parque de Atracciones de Madrid, Selwo Aventura*, Selwo Marina*, Faunia or Parque Warner. Cardholders also receive important special offers and discounts. 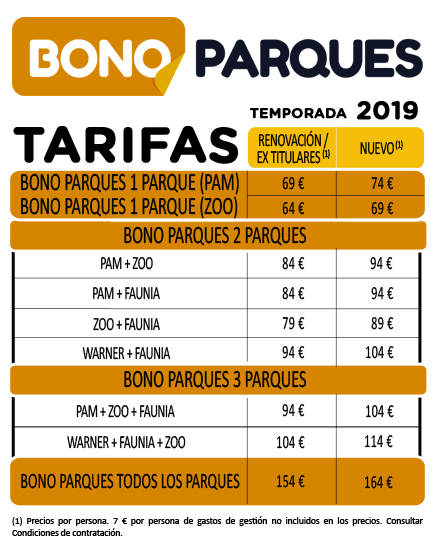 Find out about the new Bono Parques, choose the one that best suits your needs and take advantage of the many discounts on offer.